The Aztec headdress was an important and central design piece that completed the outfit of some of the more important Aztec people and the actual making of the headdresses itself was an ingrained part of the Aztec culture. The headdress was not only an addition to the wearers style but was a symbol of status or the wearer. The headdresses were not to be worn by the average Aztec, and there were even laws in Aztec culture to ensure certain designs were made only for specific people. In this way a headdress would be a measure of an Aztec citizens status and were a truly important item in this civilization. The types of adornment crafted on the headdresses were restricted, and the items used for ornaments included a variety of objects that the Aztec people would procure. These decorations included shells or all kinds and colours, metals, feathers of local birds and beads and precious stones. There was a certain feather that only a specific Aztec could wear. For example, Aztec warriors called Cuauhocelotl, were prized with feathered helmets that distinguish them for their bravery or skill. On the other hand, specific headdresses can only be worn by nobility. Their headdresses would be adorned with the brilliant blue-green feathers of the Quetzal bird which came from the distant rainforest of Central America, and these were accented by precious gems and gold reaching up to three feet height. These headdresses adorned with the feathers were almost like a crown worn by the kings of Europe. The Aztec nobility dressed to impress to show off their status, and their headresses also had deep meaning through their sacred connection with the gods, as the heavenly beings were also believed to have worn headdresses. The headdress of the Aztecs formed a disc in shape which represented the universe and the sky. Once worn it would reminded the Aztecs that they should be one with the universe, and this was a central part of the wearing of headdresses. The feathers on the Aztec headdresses, held a sacred status, the god Huitzilopochtli was the God of the featherworkers, known as Coyotlinahual or the ‘ones who crafted the feathers’. All different aspects of Aztec life incorporated the use of feathers, and apart from being the major adornment in headdresses, they were also utilized in clothing, artworks and even in the armor of a warrior. Aztec featherworkers worked full time to produce luxury goods for the nobility, and the Aztec headdresses were surely one of the most important items. 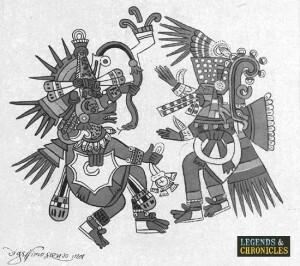 Why did the Aztecs adornt their headresseses with feathers, and what was the fascination with feathers? Perhaps it was the simple fact that birds can do what no human can do, they can fly! Birds can soar up to the Sun God, unlike the Aztec citizens, and in connection to this phenomenon is the fact that one of the most revered Aztec god was Quetzalcoatl, the Creator God known as ‘The Feathered Serpent’. Quetzalcoatl had the power to move freely not only on earth but through the skies and even the underworld, and maybe this explains why feathers were so important in Aztec decorations. A famous Aztec Headdress that has caused much controversy is one that is believed to have been worn by Aztec Emeperor Moctezuma II. It was made of the quetzal and also mixed with other feathers, set with precious stone and gold. This headdress was found in Austria and then lent to Mexico for exhibit when scholars made the connection that it was indeed an Aztec headdress. It is still unclear if the headdress truly belonged to the Ancient Emperor and how it came to Austria. Speculations would have us believe that the Spanish Conqueror of the Aztecs, Cortez, took it from the Aztecs and gave it to the Spanish King, explaining how the headdress would end up in Spain.